The Mighty is a powerful unit that can be made even better with just the simple addition of some Mighty vaporizer accessories. 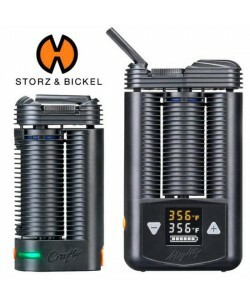 There is a wide selection of them offered by Storz & Bickel, coming straight from the manufacturer of this vape to ensure compatibility and quality. It begins with a 110-volt power adapter for use in charging the Mighty, and goes so far as to include a 12-volt car charger as well for charging your Mighty vape while on the go. The Mighty cooling unit is a device that allows you to cool your vapor down as you inhale it, lending you a much more pleasant experience than you might get from vaping straight from the unit itself. Buy one, or buy a set of 3. With these units, you can also purchase additional 4 mouthpieces designed to make your session even more comfortable, and so you can keep replacement parts on hand. There is also a Mighty wear and tear set for the cooling unit(s) to help you to keep it in the best shape possible to increase its longevity. Alongside accessories offered above, you can also get replacement Mighty vaporizer parts such as sealing rings, differing sizes and textures of mesh screens, a liquid pad set for using concentrates in your Storz and Bickel device, a set of 30 lip pieces, and two separate tools to help you fill your vape more easily and efficiently every time. Reliable - Review by Angela M.
I had a great experience on this site. I love my vape. Thanks for the fast shipping. This site is the best - Review by John M.
I sent this in really quickly as a thanks for the service that this company gave me on my recent order. I'm totally satisfied. Happy customer! - Review by Paul A. Never before have I had an online store be so attentive. It is great to know that the person that helped me truly cares about what I need. These products helped me quit smoking entirely. I'll be ordering again.